Soup is one of those magical elixirs that makes everything better. It’s warm, comforting and is just a feel-good meal, whether you’re healthy or under the weather. Colorado cafes and delis are dishing up some seriously to-die-for soups. 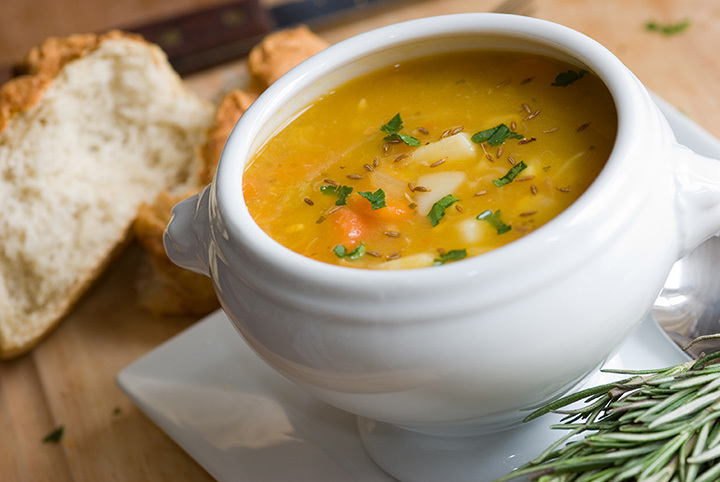 From hearty chowders to energizing kale, here are the best places for soup in Colorado! A love of unique flavors dominates the soups at this casual, counter-serve restaurant. Homemade soups, which follow the seasons, are a specialty. Fresh ingredients are used in all made-from-scratch consommés, chowders, gumbos and gazpachos. On any given day you’ll find broccoli gruyere, chicken pot pie, loaded potato cheese, tomato basil and their signature Croc soup, a New Orleans-style andouille sausage and chicken gumbo meal in a bowl. A true New York deli in this rocky mountain state is a rarity. Step into this deli and you’ll want to say “mazel tov.” The owners bring in traditional ingredients from New York. All breads and bagels, made daily on the premises, are delicious paired with a bowl of homemade matzoh ball soup. Also on-hand is a sweet and sour cabbage soup and a spectacular red borscht. Daily soup specials keeps customers coming back over-and-over to this local eatery that makes more than 1,000 gallons of soup a week at their various locations. The menu, never the same, features locally-sourced ingredients. You can’t have soup without bread, which is baked fresh daily. Popular favorites include potato ranch, broccoli cheddar, beef cheeseburger chowder, chipotle sweet potato, miso vegetable and, of course, a just-like-mom-made-it chicken noodle. Buy by the cup, bowl or quart. Enjoy a different healthy soup every day that’s made with fresh, local ingredients and showcases the best of the region’s organic harvest. This bright, cheery spot pays homage to its sunny name with a rotating selection of vibrant soups: Italian white bean and artichoke, root vegetable, creamy ham and bean, sweet potato bisque, tomato florentine, squash and apple bisque and cheesy potato are just a few highlights. A commitment to sustainability adds to the feel-good vibe here. The food served here is so good you might think it’s bad for you. It’s not! Plus, you’ll never find unnatural additives, preservatives, artificial ingredients in any dish. Responsibly sourced fare is the focus. And there are paleo, dairy-free, vegan and gluten-free options. The signature beef broth is made weekly, from more than 70 pounds of local beef bones. Top soup favorites are spring chicken and pesto soup, a variety of bisques and the daily bean pot. Located in a 1906 building that started out as a two-room cabin, this converted residence is now home to a community gathering place that just happens to serve handcrafted baked goods, artisan breads and homemade soups. Highlights worth trying include creamy potato, posolé and green chile with chicken. Authentic Thai food is served only of Thursday, which, of course, means a creamy Thai curry soup. Offset the savory fare here with a sweet treat. Artistry abounds at this charming eatery from the art on the walls to the food on the plate. The palette used here brings together fresh, healthful ingredients. All soups embody the creativity and artistry of the chef-owner and are full of bright, beautiful, fresh and delicious components. Vegan, vegetarian and gluten-free options are always available. In addition to the very veggie kale and the vegetarian minestrone soup, there’s clam chowder, tomato basil and pork green chile to choose from, plus daily specials. Take a walk along The Riverwalk in the historic downtown section of town and you’ll stumble upon unique shops, notable landmarks and a diverse selections of places to eat and drink. This multifaceted eatery is one such place. It’s a place for a comforting meal, live music, chess games and poetry readings. Grab a bowl of tomato bisque or French onion soup or creamy spinach bisque and stay awhile. This little-known cafe may just be the best deal in town. Yes, it’s in the local hospital, but you don’t have to be a patient to eat here. The talented chefs in the hospital kitchen create homemade soups daily. The soups are as diverse as the different chefs who create them. Diners are treated sweet and sour, potato, African peanut, Italian wedding, vegan cream of fennel, coconut curry lentil or curried cauliflower. Visiting hours are 7am to 6:30pm. Cowboy up! Grab your hat, put on your best boots and stop by this cowboy bistro that serves chuck wagon fare. The jalapeño cheese soup is zesty, cheesy, creamy and hearty. Of course there’s chile, both a meaty and a vegetarian version. Pair any of these heartwarming meals with a homemade cheddar-onion biscuit. You’ll be ready to ride-the-range after a meal here.